How many closet Clemson fans do we have around here? Not me. I want Alabama to stay elite until Pruitt gets the boys coached up. I want Tennessee to begin their turn downwards. Clemson is taking lots of Tennessee boys out of our backyard. Another national title won't help. Actually can they both lose dang it? I'm surrounded by folks who wear the wrong color orange but for the most part they don't give me nearly as hard a time as dawgs and bammers did when I lived in Georgia. 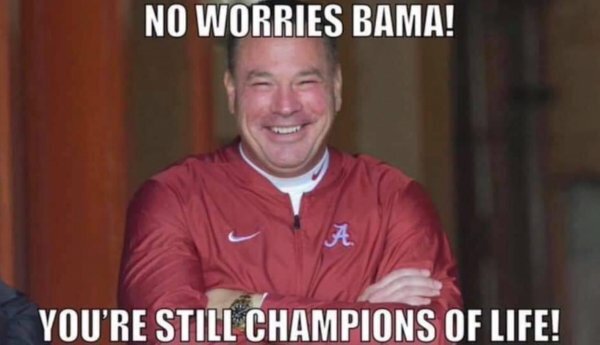 I really don't care who wins but it would be more personally satisfying if bama lost. Pulling for Bama because they're in the SEC is like pulling for the Devil cause he's in the Bible. $aban sorta blames himself for calling for the fake field goal & then blames one of his players for missing a block. Where does that buck stop coach? "We thought we had a really, really good fake, and somebody didn't block a guy they were supposed to block, and so it didn't work. So it was a bad call. It's always that way." The best part of it all is the fact that Butchy was denied a NC ring. That was as close as he’ll ever get to one.